The sophomore slump is something that feels inevitable, especially in the current climate of music where attention spans are shorter than ever and anyone can be famous if you have enough Twitter followers. In 2013, CHVRCHES went from being an underground buzz band and straight into H&Ms across the world. That year was packed full of solid debuts, from HAIM and The 1975, to Lorde and Bastille. But there was always something about the Scottish trio that made them stand out from their peers. It was this combination of pulsating, electronic 80s-inspired beats that served as the foundation of Lauren Mayberry’s almost too sugary, sweet vocal stylings, and CHVRCHES’ conscious branding of themselves. In a recent interview with Consequence of Sound, the band admitted that if they made Mayberry their focus and really marketed themselves as another electronic band with a cute female singer, they would have sold more albums. While that might have been true (or definitely true), they would also be just that…another electronic band. So they put out their stellar debut The Bones of What You Believe (with an emphasis on being an equal parts trio) and toured relentlessly with it, and people liked it. They really, really liked it. Now comes the pressure of a second record: To put something out that people will really, really like. Again. CHVRCHES are the first band out of that mini Golden Age of artists from 2013 to unleash their sophomore offering, and they’ve set the bar extremely high. Every Open Eye took the best parts of their debut album and made them better, stronger, and with more confidence. Depending on which side of the fence you fall on, you can call the move surprising or unsurprising: It could have gone darker, deeper, and with less synths. As a listener, one expects a band to attempt to recapture the magic of their first album (and fail) or go in a completely new direction (and fail). But the great thing about Every Open Eye is that CHVRCHES boldly made a statement: You liked us before, so here’s more of us…and you’re going to like us even more. Normally, electronic music isn’t my thing, but there has always been something about CHVRCHES that has drawn me in and held my attention. On a surface level, their arrangements are unique and layered; they feel like they have more thought than a typical thumpa-thumpa song. The juxtaposition of this really precise and digital backdrop with Mayberry’s vulnerable, soft, and untrained voice makes it different. If you strip down the synths, there beats a very emotional and diverse heart. While CHVRCHES have established themselves as a force to be reckoned with in this conglomerate of alt-electro-pop, the most striking thing about them – and what keeps me coming back – is Lauren Mayberry. She’s unassuming – a small, seemingly fragile creature with literal glitter in her eyes – and even though her voice matches with her exterior, she still manages to pack a punch and a whole lot of strength. Dealing with constant streams of misogynistic comments and physical threats that only a female lead singer would come across, Mayberry stands tall and has perfected the balance of being private, but not silent. It’s always been something that I have greatly admired, and it comes through in CHVRCHES’ music. CHVRCHES play to their strengths – a one-two punch of Mayberry’s vulnerable execution and Martin Doherty’s powerful production. 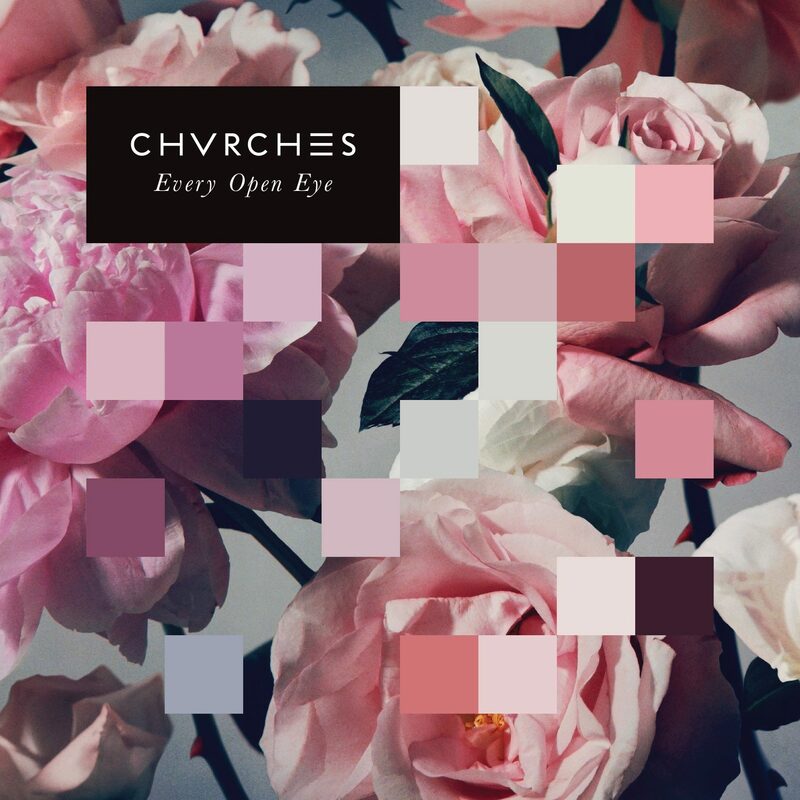 Every Open Eye is an album filled with texture that floats through every aspect of relationships, and CHVRCHES are at the forefront with analysis of human behavior, using their own experiences as the narrative. My favorite bit of Every Open Eye is the consecutive three-track combo of “Make Them Gold,” “Clearest Blue,” and “High Enough to Carry You Over”. “Make Them Gold” is an uplifting song that builds your confidence along with the band’s meticulous journey through the creation of this album. “Clearest Blue” touches upon your weakness of yearning for a lost love. “High Enough to Carry You Over” breaks up an otherwise all Mayberry-led album. While her vocals are killer, Doherty’s raw and unfiltered delivery is welcomed in the atmosphere at the halfway point of the record. It also adds support to their original marketing plan: More than just an electronic band with a pretty face. What CHVRCHES have done with their sophomore album is to create a new space for their particular brand of pop. Soaring past other electronic bands like Disclosure, they have made a record that is more accessible, but edgy enough to keep their ‘indie cred’ for what it’s worth. The beauty of CHVRCHES is that they’ve discovered who they are, and they’re not afraid to continue to be themselves. And guess what? We still really, really like them.